To make the marinade, whisk together soy sauce, Sriracha, sesame oil and sherry in a large bowl. Heat rice according to package instructions. Heat a large wok over high heat until very hot, about 1 minute. Add 1 tablespoon peanut oil and the ginger and garlic. Stir-fry until fragrant, about 30 seconds. Season steak with salt and pepper and add to wok; stir-fry until browned on the outside but rare in the center, about 4 minutes. Transfer steak to marinade and toss to coat. Add remaining peanut oil and the bok choy, jalapenos, scallions and honey to wok. 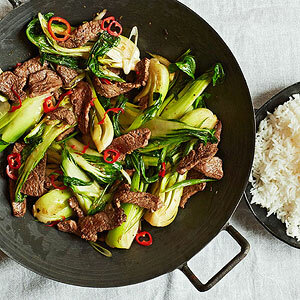 Stir-fry until bok choy is crisp-tender, about 4 minutes. Return steak and marinade to wok and cook about 2 minutes for medium rare, stirring occasionally. Serve with rice. PER SERVING: 350 cal., 14 g total fat (3 g sat. fat), 543 mg sodium, 35 g carb. (3 g fiber), 20 g pro.